The post is the second post in our series on "Frequent Asked Questions." 1- Why Plant Churches? 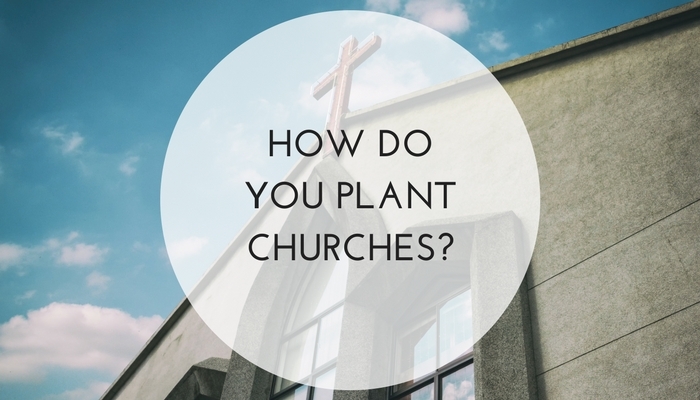 2- How Do You Plant Churches? Each month I join about seven other church planters for conversation, dreaming, the licking of wounds and encouragement. It’s a service station of sorts, a place to check tire pressure and fill up our fuel tanks. Recently a would-be church planting couple joined the conversation. The would-be church planters were dreaming about moving their lives from fly-over country to the sunny sands of Miami for the sake of the gospel. They were pressed. This wasn’t something they were wanting to do or something they needed to do. This was the other sort of pressing. The kind many wish they felt, or sometimes create for the sake of expediency. They were dealing with a call. And a strong one at that. The dreaming church planter took their comments in stride, by each blow feeling both overwhelmed and underwhelmed. Because they, like any sober-minded church planting couple, know the reality. Starting a new church in an unknown city is like weaving in and out of traffic. It requires belief, grit, and a clear-headed realization of self. A new church plant is most always birthed out of the dream and the conviction of a leader and his wife, if he is married. This is the starting point, the first and most important stone laid on the ground. But the role of this man and his supporting and believing wife is too important to get wrong. For proper beginnings, the most important aspect of this newly minted man is his capacity to be measured against the New Testament’s qualifications of elder. Elder, which is the more common verbiage in the New Testament for the role of pastor, is a man-leader that possesses three things: call, desire, and alignment to the Biblical qualifications. So, it’s true to say a church planter must be a pastor, because the church planter is a type of pastor — entrepreneurial, risk-taking, a movement-starting type of pastor, but a pastor nonetheless. It’s important to make this point because in expediency, shortcomings are weighed against strengths, and when strengths are especially strong, blaring shortcomings can be overlooked. [quote]It’s important to make this point because in expediency, shortcomings are weighed against strengths, and when strengths are especially strong, blaring shortcomings can be overlooked. [/quote] This is the dark-side of church planting, when the church gets the wrong man, or, perhaps not wrong, but the ill-prepared man or even the unqualified man. This can happen for multiple reasons. Sometimes this happens because we rush. We rush when we have such a strong focus on sending, we miss cues that tell us to stop, or at least slow down because the time is not right. We also get the wrong man when we view church planting as a junior varsity league for pastors, a place to get your feet wet and “give it a go.” But the reality is, church planting is extremely taxing and trying and not a place for someone to ‘learn the ropes’ as they say. More sinisterly, church planting is where pastors live without accountability. A place of extreme autonomy, independence and name-making. But, this is not church the way Jesus intended it. A church planter is someone who desires this ministry, it’s someone who is qualified for this ministry, and it’s someone who is affirmed to this ministry. Someone might say, “church planting is not for the faint-hearted,” But, maybe this isn’t true. Maybe church planting is only for the faint hearted with one caveat, it’s for the faint of heart who know they are the faint of heart. And this of course is the reality. It’s the reality because church planting is a Christian endeavor, God uses the weak for their weakness, not in spite of it. It is the broken who see God, not the proud. So the key element of a church planter is a broken and redeemed man, someone who’s not fooled by wit or charm or by dynamics, but someone who’s starred in the dim mirror and knew it was dim. To say a broken and redeemed man is to also say the gospel - understanding - projecting - believing - living man. For this reason a gospel-girding is the number one marker of a church planter. He must know his weakness and inadequacy and the power that rests in God to save, equip, empower, bless… and create. Because church planting is a type of creating. It’s trusting in God to create something from nothing and the Church Planter can take resolve in knowing God is the first entrepreneur. He creates from nothing and makes something — always. But the proverb doesn’t end there. “Where there is no vision the people perish” this is the first half, it continues, “but he that keepeth the law, happy is he.” Proverbs ropes vision to precept. A proverbial understanding of vision is foresight plus rooting. Vision is understanding the dream, visualizing it, imagining not what is, but what can be; and it’s rooting it’s stems into the purposes of God for this unique moment in time. This, according to the proverb, makes a church planter happy. It’s helpful for a church planter to not only be a certain type of man, a man girded by the gospel, but to also be a dreamer. In the beginning the church planter needs to see the where and be less concerned with the how. God provides the how. He provides it in yet unattained skill sets and he provides it with people. However, before these come — before the how comes, the church planter needs to be able to conceptualize the where. The more the years pass the more I realize the importance of team. This occurred to me at a recent church planting round table. We had a guest who hadn’t attended before so we did the obligatory introductions through the circle. “I’m so and so from this church” and another, “I’m so and so from this other church” and then again another, “I’m so and so from this still yet, other church” until it came to me. It occurred to me that every church in attendance sat in isolation except ours. All three of us were there, in fact, all three of us are always there. I desired for the other guys what I was experiencing — team. Jose Abella, the lead pastor at our church, often jokes, “between Alex, Jesse and I we make one decent pastor.” The funny thing about his statement is that it’s obviously a joke, but it’s also extremely true. The three of us make one decent pastor. By saying this Jose is acknowledging something everyone will conceptually agree to but practically ignore. God has gifted his people differently and complementarily. Not only are the parts different, like how water is different than sand, but they complement each other like waves on a beach shore, rustling the sand into a gritty substance. The presence of three pastors at Providence Road Church doesn’t diminish the role of pastor, it intensifies it. If a church planter is going to plant a successful church he will do it with a team or he will not do it at all. He will search for men and women and children to support God’s endeavor to plant a church. He won’t speak about what he is doing, he’ll talk about what they are doing. He won’t speak about his dream for the church, but rather their dream for the church. The Scriptures teach this and compare people working together to a corded rope, how when three cords combine together they create a strength neither of them had alone. I like to think about church planting like that. I want to intertwine my life and pursuits in with other people, because I’m less likely to break standing next to my brothers. Earlier I spoke about the where and the how. I mentioned that the man with a vision must see the where if he wants to plant a church. I wasn’t trying to communicate that the how is unimportant, I was trying to present it as a sort of math problem. I was taught in secondary school about the Order of Operations, it is a do this and then that type of method. In church planting there is definitely an Order of Operations. There are things you do first and then things you do next. At some point within a church planting strategy the question of how arises, these are the details. Once the where is established and a team is gathered, it’s now the work of the team to figure out the how. When the church planting team is developing their plan they are answering several questions: Who are we? Why do we exist? What is our purpose? How do we accomplish our purpose? What do our services look like? How will we live in community? How will we engage our neighbors with the gospel? Who are our neighbors? Who are we targeting? Where will we meet? Inevitably a church plant will push off from the shore with a thousand unanswered questions. Questions they knew not to ask. Questions others didn’t know they should ask. When a church planting team creates a plan they are attempting to minimize surprises and prepare for the rough seas ahead. By God’s grace their preparation will get them far enough and God’s providence will gird their efforts. A church planter needs to gain a fearlessness in fundraising with the understanding he is raising money and support for God’s kingdom and not his own. At Providence Road we’ve communicated partnership as a three-legged stool. Partnership is first people and prayer. Send us your teams and plead our case before the Lord on your knees. Second, partnership is giving. It is funding a church to accomplish their mission. Third, partnership is reciprocal. Our desire in partnership is that we can be a resource to sending and supporting churches to communicate what the Lord is accomplishing through their support and to be a cheerleader for missions onsite and in person speaking to their people. And finally, as Jose Abella says it, “A vision of church planting without a vision of multiplication is no vision at all.” [quote]A vision of church planting without a vision of multiplication is no vision at all. [/quote] Providence Road Church began as a church plant with the desire to be a church planting church. If we are to be faithful to Christ’s commission to make disciples of all nations we begin with planting churches in the land beyond the lines, the frontiers. There are other things about church planting I could have included. I could have spoken about mission statements and core values, about Community Group strategies and music. But, the focus of my work here has been on building a movement from beginning to end, painting with a broad brush the elements I’ve learned to see as important. And so, I say again what I said at the start, a successful church plant begins with a man, then a vision, then a team, then a plan, then a structure of support and finally, before the doors open and the church meets, a vision for multiplication.